Don’t let the chaos of life take away your favourite ritual. 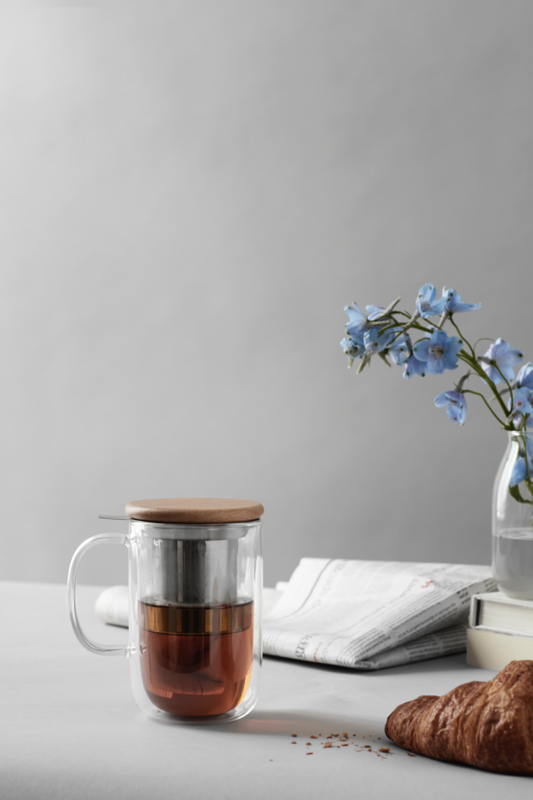 Rekindle your love of loose leaf tea with this thoughtfully designed double-walled mug. Convenience and beauty are not often a common pairing. Find both with this infuser mug. A perfect brew awaits. Size: L: 13.0 cm - H: 14.5 cm - Vol: 0.50 L / 17.00 fl. oz. When life gets too overwhelming, it’s very easy to slip out of a daily routine. Breakfast is had on the run. Exercise is skipped. Dinner is ordered in. And your beloved pot of tea falls by the wayside. It’s far too easy to get so caught up in the day, that the importance of these rituals is forgotten. Now is the time to remember. Your daily tea drinking ritual with your favourite teapot made you feel centred and calm. You took moments for yourself and were then ready for anything that came at you. Good or bad. The obvious problem with brewing a pot of tea is that it’s time consuming. It’s a lot of effort to go to that is definitely worth it, but as soon as life gets hectic, it takes a backseat. Now, you no longer need to skip over your favourite daily ritual. 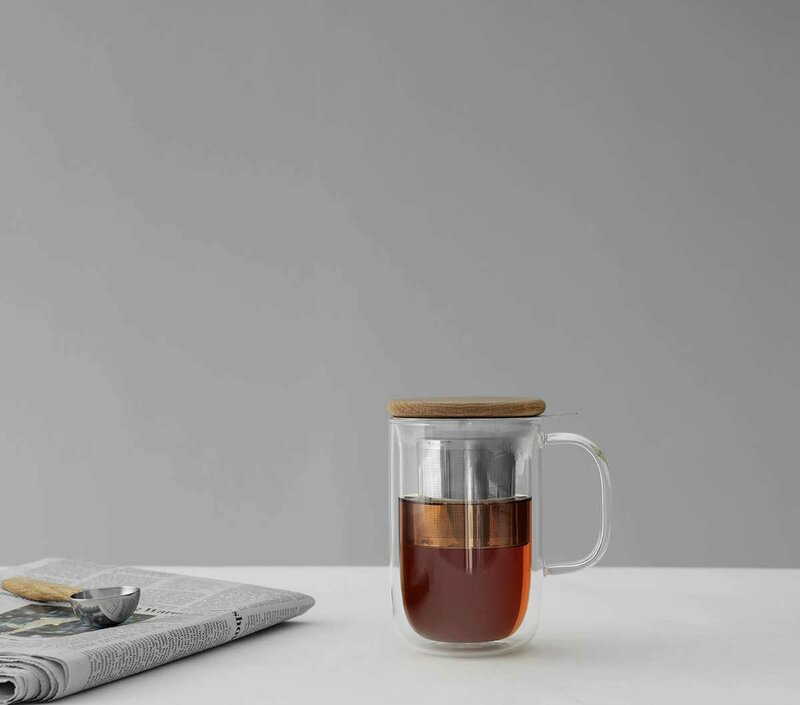 You can now have tea both simplified and amplified, with the Minima Balanced Tea Cup. This mysterious mug has its own built in infuser, making loose leaf tea drinking more convenient and easier than ever before. 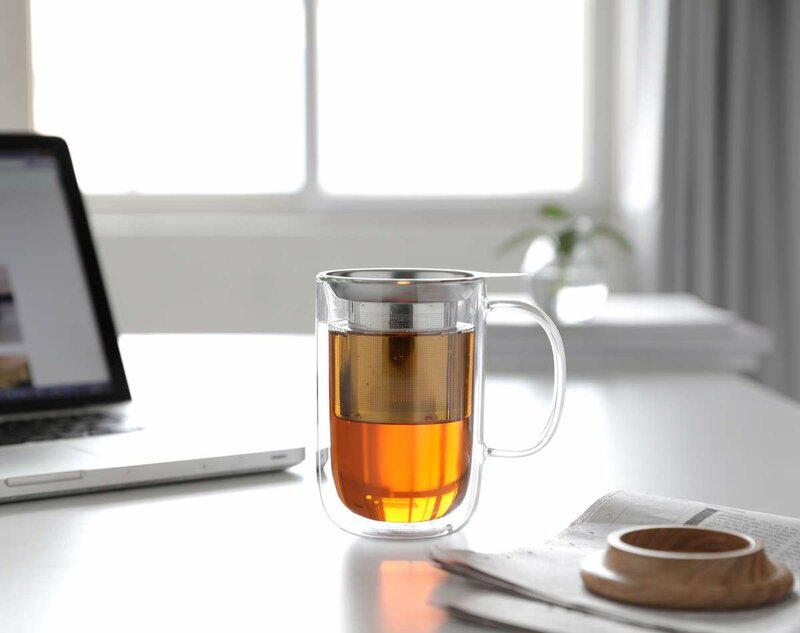 The other little secret about this mug is that it is a double walled glass design meaning that your tea magically floats right before your eyes. Watch in wonder as water blossoms into tea. You’ll never tire of the beautiful show and the perfect taste with this well considered mug. Does this cup come with an infuser? Yes, it comes with a removable stainless steel infuser so you can make perfect tea straight in your tea cup. Yes, this clever glass cup has a double-walled design to keep your drink warm while keeping the outside of the mug from getting too hot. Drinks will stay hotter for longer in the Minima Balance tea cup. No, this mug is not microwave safe. What are the advantages of a glass cup? Glass is a wonderfully sensory material to house your tea. Being clear, it means you can enjoy your drinks visually and better appreciate the way their colours play with the light. Even better, in this double-walled design your drink will appear to float within the cup. How much tea does this cup hold? This generously-sized cup holds 500 ml of your favourite brew.